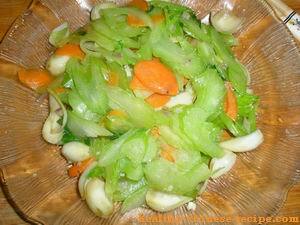 This Stir Fried Celery and Lily Bulb is very popular Guang Zhou style dish in Chinese restaurants. It helps to remove heat in the liver and in the heart, suitable for those who are with high blood pressure, insomnia, coronary heart disease, and obesity, etc. Guang Zhou style dish is featured fresh, light flavor, and elegant. No much sauce, just enjoy the food's original flavor. So don't add in too much garlic, onions, or any other seasonings. It's also one of the favorite vegetarian recipes. Wash lily bulb, peel, separate layer by layer. 2. Heat oil in a wok, add Seasoning A. Sway the wok, let the fragrance comes out. 3. Add celery, lily bulb layers, and carrot chips. Stir fry till the out edge of lily bulb becomes transparent. 4. Add Seasoning B, stir fry till the sauce well coached, about 1-2 mins. 5. Turn off heat, serve with warm. Clearing away heat on the heart and the liver. Good to those who are with high blood pressure or insomnia. 1. About the material, usually choose sweet lily bulb and western celery.